You like sausage, but you know that such a high-fat meat is not the healthiest choice. So you turn to chicken sausage, figuring that the chicken version must be better for you. But chicken sausage can be high in fat and sodium too, and the amount varies from brand to brand. Knowing the nutrition facts for chicken sausage should encourage you to examine your brand at the grocery store a little more closely before bringing it home. Depending on the brand and flavor of chicken sausage, one link -- which is 85 grams -- can have between 140 calories and 180 calories. 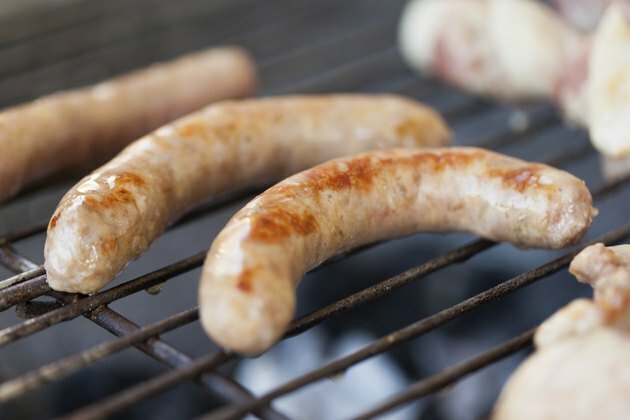 Comparatively, the same serving of a beef or pork sausage has about 200 calories in the same serving. Although the chicken sausage is a lower-calorie option, it is still considered a medium-energy-dense food and therefore has a high calorie content compared to its serving size, leading you to consume more calories to fill you up. Although poultry is generally considered a lean source of protein, chicken sausage is high in both fat and saturated fat. One serving of the sausage contains 7 to 12 grams of total fat, 1.5 to 3.5 grams of saturated fat and 60 to 85 milligrams of cholesterol. The publication "Dietary Guidelines for Americans, 2010" recommends you limit your daily total fat intake to 20 percent to 35 percent of calories and saturated fat to less than 10 percent of calories. On a 2,000-calorie diet, that means 44 to 78 grams of total fat and no more than 22 grams of saturated fat. Additionally, limit dietary cholesterol to less than 300 milligrams a day. Getting too much fat, and especially saturated fat, in your diet raises your risk of heart disease. Chicken sausage is a good source of protein, with 12 to 14 grams per link. Most Americans get more than enough protein in their diets, says the Centers for Disease Control and Prevention. On average, men need 56 grams of protein a day, and women require 46 grams. So one link meets 20 percent to 30 percent of your daily protein needs. As a high-fat meat, however, the chicken sausage is not a healthy source of protein. As a processed meat, chicken sausage is very high in sodium. The amount of sodium in one link ranges from 500 to 870 milligrams. Getting too much sodium in your diet increases your blood pressure. In general, you should limit your intake to less than 2,300 milligrams a day. But if you already have high blood pressure, are over the age of 51 or of African-American descent, you should limit your sodium intake to less than 1,500 milligrams a day. Chicken sausage is a source of iron. One link meets as little as 4 percent of the daily value to as much as 35 percent of the daily value, depending on the ingredients. Iron deficiency is a common nutritional problem, affecting 80 percent of the world's population, according to the Office of Dietary Supplements. Iron helps carry oxygen throughout your body, and not getting enough in your diet can lead to fatigue, poor concentration or difficulty fighting off infection. Women between the ages of 19 and 50 need 18 milligrams of iron a day, and men and women over the age of 51 need 8 milligrams a day. U.S. Department of Agriculture: ChooseMyPlate.gov: What Foods Are in the Protein Foods Group?